Botanical Name: 1. Aloe vera L.; 2. 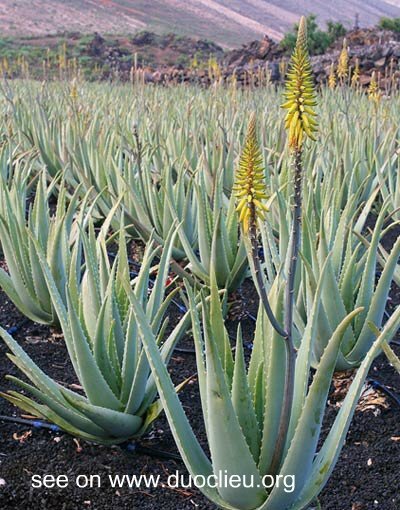 Aloe ferox Mill. Part Used & Method for Pharmaceutical Preparations: The leaves are gathered all year round. The juice is squeezed out of the leaves, boiled until it makes a thick soup and then put into a container and stored in a cool place. Meridians: Liver and large intestine. Functions: 1. To purge feces; 2. To clear heat in the liver; 3. To kill worms. 1. Constipation accompanied by excessive fire in the liver meridian manifested as constipation, dizziness, headache and irritability: Aloes (Luhui) is used with Chinese gentian (Longdancao), Capejasmine (Zhizi), Natural indigo (Qingdai) and Chinese angelica root (Danggui) in the formula Danggui Luhui Wan. 2. Abdominal pain caused by accumulation of worms manifested as sallow complexion and emaciation: Aloes (Luhui) is used with herbs that kill worms, in a formula such as Feier Wan. Cautions & Contraindications: This herb is combined with other herbs in pills or powder, but should not be used in a decoction. It is contraindicated during pregnancy and in cases with weakness of the spleen and stomach manifested as poor appetite or diarrhea.